A former US attorney general has ripped into Donald Trump over his tweets in regard to the FBI. 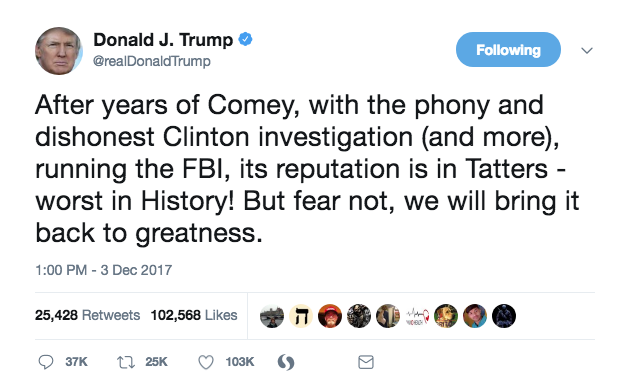 Over the weekend, the US President said the reputation of the FBI was in "tatters" after years of being headed up by James Comey. He blasted the investigation into Hillary Clinton's use of a private email server for official work as Secretary of State and claimed he would restore the bureau to "greatness." In response, Sally Yates - a former attorney general - hit back at Trump, saying the only thing in "tatters" was the president's respect for the rule of law. The tweets by Donald Trump came mere days after Michael Flynn, the former national security advisor, pleaded guilty to lying to the FBI about his contacts with Russian officials. Yates, meanwhile, was fired by the US President after refusing to defend his travel ban in January.